And yet, it isn’t so much the film’s story, but in its telling that Motwane woos you. At the heart of this film is a young couple faced with insurmountable odds. Moving without resorting to melodrama, ‘Lootera’ is bittersweet in the end. Formerly an assistant to Sanjay Leela Bhansali, Motwane reveals the same command over technique, and a similar love for sweeping visuals. But unlike Bhansali’s recent films, Motwane never distracts you with his tapestry. I’m going with four of five for ‘Lootera’. Drop whatever else you’re doing, and soak in this love saga. Penned with utmost sensitivity and crafted delicately and thoughtfully, the film is akin to a beautiful painting on celluloid! LOOTERA bears the look of a classic. The visuals, the shade palette, the objet d’art, the milieu, the apparel… even the way the characters communicate at an unhurried, easygoing pace and share emotions takes you back to the bygone era. On the whole, LOOTERA is an intrinsically earnest and profoundly heartwarming story that stays in your heart. An absolute must for those who love romantic films or are romantic at heart. This one’s a cinematic gem! As much as I’d like to reward Lootera for it’s craft I firmly believe that films can only win you over with the ability to tell a story. And this is where Lootera falters. It allows you to drift away. And this is why Udaan, despite struggling on the technical front with its 16 mm camera and stark walls, will always be an exceptional and better film. On the whole, Lootera is a beautifully made, brilliantly shot and wonderfully enacted love story which will be loved by the classes and evolved audience only. It is a painting on celluloid which will win a lot of critical acclaim and awards. It will not find favour with the masses and single-screen cinema audience which may even reject the film, mainly because it is excruciatingly slow. Motwane’s direction is so assured and confident that this scarcely feels like his second feature. The script is clearly one he believes in, and the film is resultantly free of false-notes. Even the few moments that feel like narrative missteps turn out to be masterstrokes. And, as exemplified by a breathtaking chase sequence that could result in any number of outcomes, Motwane sides with his story, not with any one of his characters. A film, then, about life, love and leaves. And in the end it comes down to the sort of snow-surrounded tree that you can draw even if you’ve always had trouble drawing leaves. Magnificent. An epic canvas, a quiet love story, a cops-and-robbers drama and an impressively sophisticated storytelling style: Lootera has all this and much more. In short, Lootera is a Bollywood miracle – a rare Mumbai film that is mounted on a lavish scale and yet dares not to play by the established norms of the marketplace. Now the big question: will a film like Lootera work at the box office? The question is irrelevant. It wouldn’t matter, at least from the critical point of view. It would still be a magnificent film. 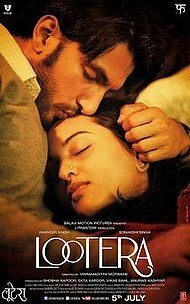 I should have watched Lootera backwards, because it finishes with an almost unbearable loveliness. The ache in the heart comes as a welcome relief, but a little too late. But I wish Singh had been freed up more. His slate is bland. Much of the first half of the film is too, being revved up by its background music. her Lootera should have had more heft. So should have the film. It has left me with some indelible scenes which are sheer poetry, but this is one of those films that I wanted to like much more than I did. Also, Yeh Jawani Hai Deewani and Student of the Year failed to impress you in spite of brilliant performance at the box office, Lootera is where your wait might end. Your search for a movie that is better than a typical Bollywood Masala film and creates an entirely new definition of entertainment stops right here. If an artistic cinema is what attracts you and you loved Motwani’s last film Udaan, you can’t afford to miss this one. What’s Good: Meticulously detailed, gently woven, beautiful film that boasts of its overpowering performances. What’s Bad: Perhaps the calamity could be enhanced, but art films with its quality of minimalism works for it. Watch or Not? : Vikramaditya Motwane’s Lootera is sheer brilliance, poignancy and magic woven on celluloid. With a sinewy narrative and prodigious performances, especially from Sonakshi Sinha, this film can easily claim to be a plush masterpiece! Director Vikramaditya doesn’t dazzle you with great dialogues or attempt to impress with fifties’ nostalgia. He is content just telling the story and bringing his old world characters to life. Lootera has all the right rhythms and it moves along without losing its conviction, and casting it’s hypnotic spell. The fault, if you can call it that lies in the fact that the audience who’ve been fed on a steady diet of masala fare, will find this slow and tedious. This won’t appeal to the fast food and romcom generation. It is a different beast. It is a nuanced movie that doesn’t have the bite but it has the beauty that you will find appealing but you have to surrender yourself to it. You will like this movie if: You liked Raincoat. It’s raw. It’s understated. It’s intensely heart-wrenching. Vikramaditya Motwane’s poignant tale of deceit, betrayal, honour and love, takes us on a deeply emotional journey. It’s remarkable how one-film-old Motwane manages to create such an exquisite masterpiece without ever trying too hard. Vikramaditya Motwane’s ‘Lootera’ volatile love story is unlike what we’ve ever seen before Truly worth a standing ovation.